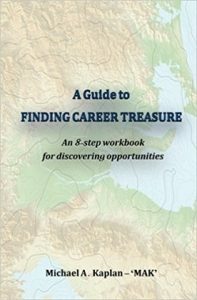 A Guide to Finding Career Treasure is not another book providing the appealing but vague career advice to ‘just follow your passion.’ It is also not a book about resumes and cover letters, or encouragement to do stereotypical ‘job networking’ which too often is a waste of time, or worse. A Guide to Finding Career Treasure explains specific steps you can take for HOW to go about creating the work future you truly want rather than being limited to what’s printed on the menu. This workbook is for college students and young professionals (and possibly some not so young). In 8 sections/80 pages, it provides detailed explanations, exercises, and actions that will enable and empower you to pursue and find your career treasure. If your life and education have taught you a lot, but maybe not nearly as much about ‘how’ to put your interests and education to work, this workbook may quickly prove very valuable to you.